You are here: Home / Weekly Columns / Opinion / Xbox One S All-Digital Edition Release: Everything You Need To Know. (ThyBlackMan.com) The long-rumored console Xbox One S All-Digital Edition is coming in April or May this year, provided the leaks are accurate. This disc-free console will come packed with a digital version of games and it will cost less than the standard Xbox One S console. Removing the Blu-Ray drive from the Xbox One S All-Digital Edition will reportedly reduce its price by at least $100. In November last year, an Xbox console codenamed “Xbox Maverick” made headlines as tipsters were sharing details about the disc-less console. Reports also suggest that the games on the Xbox One S All-Digital Edition console will be preinstalled and buyers will have an option to choose their favorite titles from a list of games. Microsoft has been selling its new subscription service called Xbox Game Pass since 2018. The subscription service provides access to 100+ Xbox games online. Newly launched games like Crackdown 3 and Sea of Thieves also appeared on the Xbox Game Pass library when these games were launched worldwide. Millions of users are currently using Xbox Game Pass, says Microsoft. It’s nothing new that Sony and Microsoft are trying to sell new variations of their consoles as the life of the current generation consoles is coming to an end. These companies want to squeeze every ounce of the investment they made into these consoles. 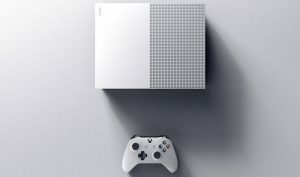 Now when the next generation of consoles is said to be focused on digital games, removing Blu-Ray disk drive from the Xbox One S is the way Microsoft is trying to sell more console units by reducing the price. The idea of going all digital has fans divided. Some players prefer building a collection of physical titles, while others are ready to lose the sense of game ownership with disk-less consoles like the rumored Xbox One S All-Digital Edition console. The only concern that many people who favor disk-less consoles have is the price. From what we have seen in the last year, it has become very clear that the cost of buying games digitally is sometimes more than what you pay for physical copies of the same games. With digital games, you lose the chance of buying games from multiple retailers. You’re limited to only the game publisher’s or the console maker’s store, for example, the Xbox Store by Microsoft. This lack of choice will force people to buy games at a higher price. Third-party retailers focus on many promotional activities such as stock clearance. As a result, in most cases, you’ll find games to be cheaper at these stores. Going all-digital can significantly reduce the cost of owning the hardware, but on the software front, there’s still no clarity on the pricing structure if the Xbox One S All-Digital Edition hits the store shelves anytime soon. It is a well-known fact that with the next generation of console, Microsoft, Sony, Nintendo, and perhaps Google are trying to create streaming heaven for players. The technology will certainly revolutionize the way we play games but it will not make any difference in the games. Apart from the problems like availability of high-speed internet, there are other risks as well. Streaming can actually degrade the overall quality of games. Similarly, buying digital games also has its own problems. For example, you have to preorder a game so you can download it in case you want to play on the launch day. If you want to wait till the reviews are out, unless you have a high-speed internet connection, you will have to wait for hours so that the game can be downloaded on your system. Like that, there are many questions that need to be answered. A lot can happen this year at E3 and even before that event takes place. It is also being said that the Xbox One S All-Digital Edition console is a precursor to Microsoft’s next-generation console codenamed Xbox Scarlett. Fans and media outlets have their predictions for what will happen in the video game industry this year, but only time will tell.